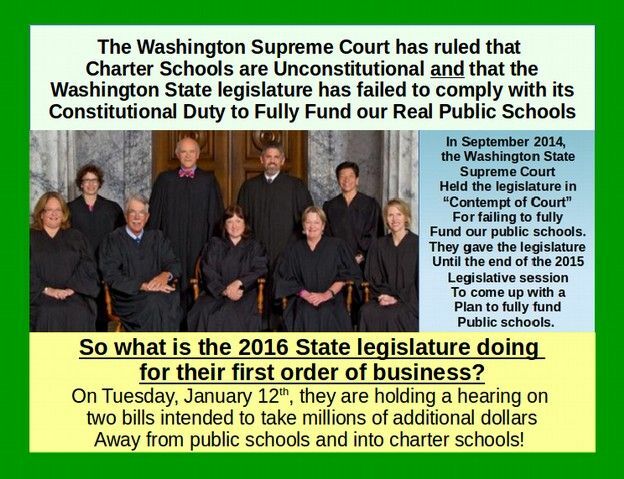 Even though the Washington State Supreme Court ruled that charter schools are unconstitutional and ordered the State legislature to fully fund our real public schools, some of the leaders of the State legislature, in a blatant act of defiance, have decided to hold hearings on two "charter school fix" bills both of which would rob even more millions of dollars from our public schools. The hearing on the two charter school fix bills will be in Olympia on Tuesday January 12 2016 at 1:30 pm in the Senate Cherberg Building. Parents and teachers who want the legislature to focus on funding our real public schools instead of funding charter schools should attend this hearing and let the Senators know that you oppose diverting any more money away from real public schools. This is the second of two reports I have written about the Charter School Fix bills to help parents and teachers better understand how the charter school fix bills would rob millions of dollars away from our real public schools. First, a quick review of how we got to this crazy place. In 2012, the Washington State Supreme Court found that the State legislature had failed to comply with their Constitutional Paramount Duty to fully fund our public schools and ordered the legislature to come up with a plan to fully fund our public schools. When the legislature failed to come up with a plan, in September 2014, our Supreme Court held the legislature in "Contempt of Court" for dragging their feet. In 2015, the legislature claimed that they added a billion dollars in school funding. But in fact, they merely restored funds that they had cut in previous legislative sessions. Therefore, in August 2015, the Supreme Court began fining the state legislature. Thus far, the legislature has simply ignored these fines. Then on September 4, 2015, our Supreme Court ruled that the Charter School Initiative 1240, funded with millions of dollars by Bill Gates, was unconstitutional in part because charter schools would divert billions of dollars away from public schools and in part because public school funds would be handed over to private corporations rather than being controlled by publicly elected school boards. In this second report, we will review the problems of this second Charter School Fix bill. We will begin by addressing some of the questions raised by my first report because these same concerns also apply to the second charter school fix. Who paid for the Charter School Initiate 1240? Are SFC and LEV real groups or fake groups? In my prior report, I pointed out that the groups who who formed the half million dollar PAC to pay legislators for promoting a charter school fix were fake groups funded with millions of dollars from Bill Gates. By fake groups, I mean that these groups are funded predominately by Bill Gates and other billionaires and not by contributions from stakeholders such as parents and teachers and/or the general public. Specifically, SFC (aka Stand For Children) has received about $16 million from the Gates Foundation and LEV (aka the League of Education Voters) has received about $14 million from the Gates Foundation. Therefore the half million dollar PAC they created is in reality a Bill Gates funded PAC. These two fake groups are only two of more than 100 fake groups funded by Bill Gates to promote his takeover of our public schools. Are the the Half Million Dollars that the WA Charter Schools PAC is giving to Legislators Bribes or Just Campaign Contributions? In my previous report, I described the half million dollars being given to Washington state legislators as "bribes." One person objected to my calling these campaign contributions "bribes." 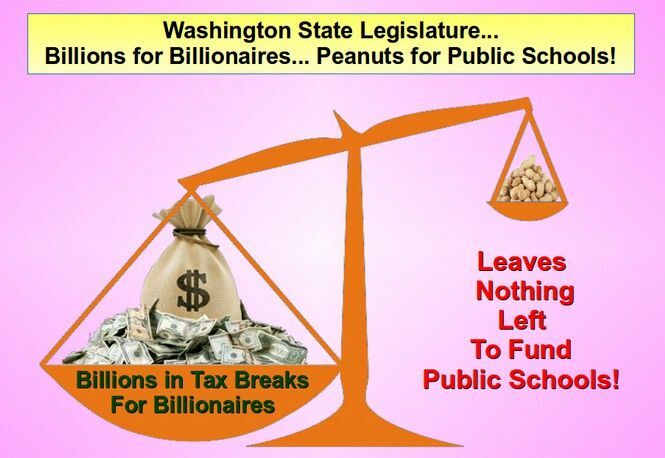 "The WA Charters PAC delivered checks of $1,000 dollars to 13 members of the house and 11 Senators, on both sides of the aisle last week, including Representatives Pettigrew (D-37), Sawyer (D-29), Senn (D-41), Magendanz (R-5) and Senators Mullet (D-5), Fain (R-47), Litzow (R-41), and Rolfes (D-23). The PAC is continuing to raise funds despite the December 10th cut-off date... WA Charters expects to raise more than $500,000 by the end of session... We know we will have more champions to thank after the session” added Thomas Franta, CEO of WA Charters." Bribe: Something given or promised to a person in order to influence dishonestly a decision or action; something valuable (such as money) that is given in order to get someone to do something; money or favor given or promised in order to influence the judgment or conduct of a person in a position of trust; to try to get someone to do something by giving or promising something valuable (such as money). Article II, Section 30 BRIBERY OR CORRUPT SOLICITATION. The offense of corrupt solicitation of members of the legislature, or of public officers of the state... to influence their official action, shall be defined by law, and shall be punished by fine and imprisonment... A member who has a private interest in any bill or measure proposed or pending before the legislature, shall disclose the fact to the house of which he is a member, and shall not vote thereon. It is a fact that the prime sponsors of both charter school fix bills have been given campaign contributions from WA Charters PAC. Numerous legislators have also received direct campaign contributions from SFC, LEV and various members of the Washington Roundtable. This sort of influence peddling is one of the worst forms of corruptions. Bills should be passed solely on the merits of whether they benefit the people and children of the state of Washington - not based upon who is offering the most money to legislators and their re-election campaigns. Are the Charter School Fix Bills Really a Framework for Fraud? One person, out of the hundreds who read my last report, objected to my use of the word "fraud" in the title of my last report despite the fact that I provided links to numerous reports of charter school fraud in other states and provided specific quotes from Senate Bill 6163 of "loopholes" that would allow the exact same sort of fraud in Washington state as has already occurred in several other states. Fraud: The crime of using dishonest methods to take something valuable from another person, intentional perversion of truth in order to induce another to part with something of value or to surrender a legal right; a copy of something that is meant to look like the real thing in order to trick people. This is exactly what charter schools are. They are a copy of our public schools in order to trick people into giving private for profit corporations money that should have gone to real public schools. The dishonest methods used include marketing campaigns that falsely claim that charter schools are better than public schools (the perversion of truth) as well as bribing legislators into allowing charter schools. The legal right that is given up is the right of our children to receive a real education from a real, experienced and highly qualified teacher. As we noted in our previous article and will show again in this article, the primary method charter schools use to increase corporate profits is to use inexperienced, untrained teachers who are paid substantially less than real teachers. A March 2015national report documented charter school fraud and waste totaling more than $200 million - but says the total is impossible to know because there is not sufficient oversight over charter schools.The report, titled “The Tip of the Iceberg: Charter School Vulnerabilities To Waste, Fraud, And Abuse,” was released by the Center for Popular Democracy. The report notes that these figures only represent fraud and waste in the charter sector uncovered so far, and that the total that federal, state and local governments “stand to lose” in 2015 is probably more than $1.4 billion. The fraud included corruption, asset misappropriation, financial statement fraud, conflicts of interest such as purchasing schemes, bribery, bid rigging, kickbacks and extortion, theft, skimming, billing schemes, payroll schemes, expense reimbursement schemes, shell companies, ghost employees, ghost students, ghost buildings, accomplice vendors, overstated expenses, fake expenses, forged checks, fake refunds, and manipulations of assets and inventories. California alone stands to lose more than $100 million to charter school fraud in 2015. The vast majority of this fraud perpetrated by charter officials will go undetected because California lacks the oversight necessary to identify the fraud. In January 2015, the Ohio state auditor released a report of the results of unannounced visits by inspectors to 30 charter schools. In nearly half of the schools, the school-provided headcount was significantly higher than the auditors’ headcount. Schools are funded based on headcount, so these inflated figures amount to millions of dollars in taxpayer dollars siphoned away from students. The second national report called Charter School Black Hole by the Center for Media and Democracy published in October 2015 found what it called an "Epidemic of charter school waste fraud and abuse." Specifically, the report found that more than $3.7 billion dollars just in federal funds has been diverted away from public schools to charter schools. Since federal funds are about 10% of total school funding, the total diverted away from public schools to charter schools may be as high as $37 billion and counting - with little to no accountability as to how those funds are spent because charter school spending is a "black hole." "This is due in part to the way laws governing charters have been built by proponents, favoring “flexibility” over rules. That flexibility has allowed an epidemic of fraud, waste, and mismanagement that would not be tolerated in public schools." The report found that millions of tax payer dollars going to "dozens of ghost schools where funds were given to charter schools that never even opened." The report also found that charter schools have a much higher failure rate than public schools. For example, Michigan has 300 charter schools and 108 have failed for a failure rate of 25%.Arizona has 600 charter schools and more than 100 closed charter schools for a failure rate of 14%. Florida has 650 charters and more than 120 closed charter schools for a failure rate of 16%. Wisconsin has 240 charter schools and 90 failed and closed charter schools for a failure rate of 27%. California has more than 1000 charter schools and nearly 200 have closed for a failure rate of 20%. According to a 2015 national study, 2,210 out of about 10,000 charters had closed for a national charter school failure rate of 22%. Charter school failures have included stunning tales of financial fraud, skimming of retirement funds, financial mismanagement, material violations of the law, massive debt, unsafe school conditions, lack of teacher credentials, failure to conduct background checks, terrible academic performance and test results, insufficient enrollment, inflated enrollment and numerous fraud indictments of charter school operators. There were also several cases of squandering of taxpayer moneyfunding going to religious schools even though state law prohibits funding going to religious schools. The decision to close schools is often based on the belief that displaced students will be moved to higher performing schools. But research in Chicago has shown that has not often happened. An Oct. 2009 study by the Consortium on Chicago School Research at the University of Chicago examined the closure of 44 public schools in Chicago between 2001 to 2006 (schools closed by Arne Duncan) and compared these thousands of displaced students to a group of similar students whose schools were not closed or replaced by charter schools. The report found that only 6% of displaced students enrolled in high-performing schools, while 82% of displaced students continued to attend schools with very low levels of academic achievement. Many schools in Chicago were closed twice... First by Arne Duncan and then after the private takeover did not succeed in improving test scores, the “charter” schools were closed again. This is clear evidence that the problem with schools in low income neighborhoods is not the school. The problem is poverty. All parents, all children and all teachers need to be treated with respect, dignity, fairness and opportunity. Closing public schools in poor neighborhoods over and over again is not the answer. It is simply another form of child abuse. Closing public schools and turning them all into private, for profit charter schools does not improve outcomes for poor inner city children because this “solution” does not address the real problem faced by poor inner city kids. That problem is poverty – their parents do not have a living wage job. The most recent study of charter school money laundering was published in December 2015 by the National Education Policy Center. This study found that there was virtually no difference between the operation and financial structure of For Profit Education Management Organizations and Non Profit Education Management Organizations. The report concluded that "Most nonprofit EMOs look, act, and have management agreements similar to for-profit EMOs. 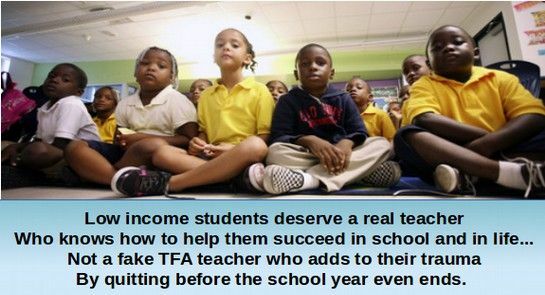 "For example, while the typical public school spends more than 60% of revenue on instruction (teachers), KIPP one of the nation's largest non-profit corporations spends only 42% on instruction mainly by hiring TFA fake teachers. This allows KIPP to pay its administrators up to $400,000 per year. So much for being a non-profit organization! 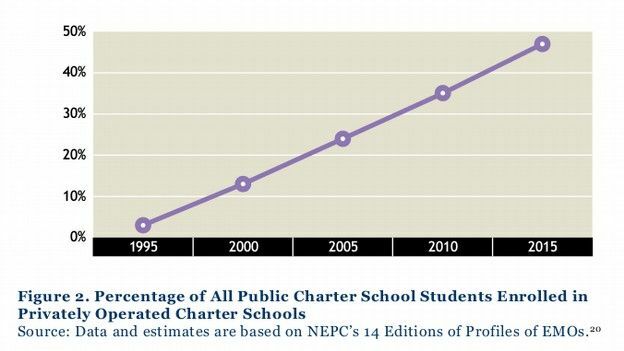 This chart indicates that about half of all charter school students are enrolled in these national chain charters. #4 Current weak disclosure requirements make it unlikely that any legal violations,ethical concerns, or bad practices are reported. The report then explained with detailed charts and diagrams how EMO corporations extract profits out of charter schools.One of the concerns raised about adding a profit motive to educating kids is the potentialfor charters to manipulate enrollment and attendance data “to maximize tax-subsidizedper-pupil funding. The report concluded that "The multiple layers of private schooloperations and management, governing boards of private citizens, and in somecases, authorization by private entities,presents far greater opportunityto shield documents and avoidconstitutional and statutory protectionsin the charter sector." Does this track record of Systematic Charter School Fraud in other States justify calling the Washington State Charter School Fix Bills a "Framework for Fraud? #7 Reduces public meetings and public accountability for parents and tax payers. See our first report for the exact "framework for fraud" loophole language in the Jan 4 charter school fix bill. Here we will review the loophole language in the Jan 7 charter school fix bill which is amazingly similar to the loophole language in the Jan 4 Fix bill. The similarity of loophole language between the two bills confirms that the purpose of both bills is not to improve the quality of education for children. Rather the point of these loopholes is to use the charter school fix bill to deliberately create avenues for funneling money away from public schools and into the pockets of private for profit corporations. While the January 4th Charter School Fix bill allows for up to 10% of all school funds (up to one billion dollars) to be diverted away from public schools to charter schools, the January 7th bill only allows about $20 million to be diverted away from public schools to charter schools. Unfortunately, this second bill is even more dangerous than the first bill in that it makes the claim that one hundred million dollars per year in Lottery funds, currently used for Opportunity Pathway funding are not restricted for use as school funding because the Lottery funds are not part of the "three protected accounts" specified in the state constitution to fund our public schools. This would set the precedent for diverting billions of dollars away from public schools in the future as all the legislature would have to do is create funding sources outside of the three protected accounts to absolve themselves of their paramount duty to fully fund schools. However, the claim that using millions of dollars in lottery funds to fund charter schools would not reduce state funding for public schools is factually false. Historically, Washington lottery funds have been used for both school construction and class size reduction. Here is a brief history of State Lottery funds taken from a 2014 State School Funding Guide: "As a result of the passage of Initiative 728 in 2000, all lottery revenues were, in fact, dedicated for educational purposes (with the exception of about 10 percent, which was dedicated by previous legislation for debt service on the stadiums in Seattle). For fiscal years 2001-2004, a portion of lottery revenues were distributed to school districts to allow them to make improvements, such as reducing class sizes, extending learning opportunities, and expanding professional development and early childhood education programs. The remainder was deposited into the Education Construction Account, which is used to fund a portion of the state matching funds for K-12 public school and higher education construction. From fiscal year 2005 through 2009, all lottery revenues were deposited into the Education Construction Account. In 2009, the Legislature redirected lottery dollars to the state general fund to support a range of state programs, including education." "by diverting common school funds to charter schools, the (Charter School Initiative) Act contravenes article IX, section 2 of the Washington Constitution." "The constitutional protection afforded to common school appropriations is not dependent on the source of the revenue (i.e., the type of tax or other funding source) or the account in which the funds are held (i.e., the general fund or other state fund). Rather, this court held that all money "allocated to the support of the common schools ... constitute[ s] a 'state tax for the common schools' in contemplation of Art. IX,§ 2, of the constitution... Once appropriated to the support of the common schools," funds cannot "subsequently be diverted to other purposes. This court cautioned that to hold otherwise "would be calamitous." The above ruling is similar to a 1983 Washington Supreme Court which held that once the legislature defines a program as an essential part of Basic Education it cannot later cut funding for the program in order to transfer funding to other programs that are not part of Basic Education. The bottom line is that taking one hundred million dollars out of the State budget for other purposes would in fact leave one hundred million fewer dollars for public schools. This makes using lottery funds for charter schools that were previously used to support public schools as unconstitutional as using general funds for charter schools. 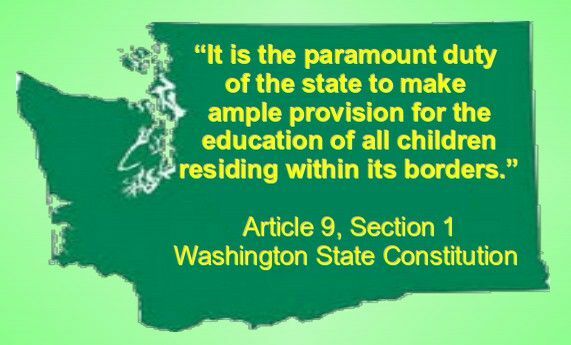 Article IX, Section 2 of the Washington State Constitution not only requires the state legislature to fully fund public schools, it also requires the legislature to provide a "general and uniform system of public schools." In ruling that charter schools were unconstitutional, the Washington Supreme Court specifically stated: "We hold that the provisions of I-1240 that designate and treat charter schools as common schools violate article IX, section 2 of our state constitution and are void. This includes the Act's funding provisions, which attempt to tap into and shift a portion of moneys allocated for common schools to the new charter schools authorized by the Act." The court explained that one of the things that made charter schools "not uniform" was the loss of local control and local accountability because they were not directed by a locally elected school board. Our Supreme Court quoted a 1909 Supreme Court ruling called Byran which stated: "a common school, within the meaning of our constitution, is one that is common to all children of proper age and capacity, free, and subject to and under the control of the qualified voters of the school district... The system must be uniform in that every child shall have the same advantages and be subject to the same discipline as every other child." "Here, because charter schools under 1-1240 are run by an appointed board or nonprofit organization and thus are not subject to local voter control, they cannot qualify as "common schools" within the meaning of article IX." Therefore because both charter school bills place the actual control of charter schools with an appointed charter school board, charter schools are not public schools. But this is not the only reason charter schools were ruled unconstitutional. The 1909 Bryan case dealt specifically with whether the legislature could allow some schools to use uncertified teachers. Bryan ruled that the use of uncertified teachers in some schools was unconstitutional because then the schools would not be uniform. Thus, even in the unlikely case that the Supreme Court ruled that lottery funds were not protected, they would still rule charter schools unconstitutional because both charter school bills specifically allow charter schools to use uncertified teachers. (see footnote 10 on page 11 of the 2015 Supreme Court ruling). In the 2012 McCleary decision, our State Supreme Court has also ruled that the legislature is in violation of the uniformity clause of the state constitution because current laws create a two tier system of rich school districts that can easily pass local school levies and school bonds thanks to high per pupil property valuations - and poor school districts that cannot pass local school levies and school bonds due to low per pupil property valuations (See OSPI Report 1061). 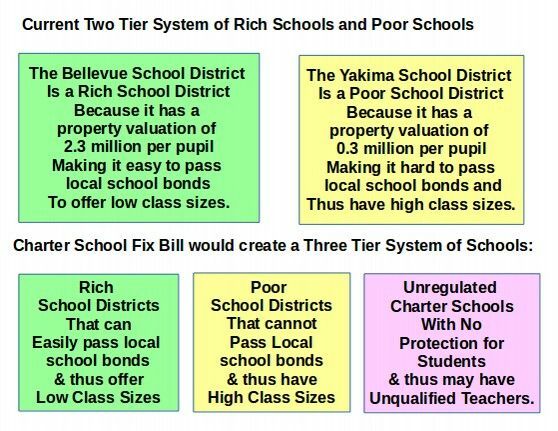 Both charter school fix bills would turn our current two tier system of rich schools and poor schools into a three tier system of rich schools, poor schools and charter schools that do not provide protection for teachers and students. Page 3: "A charter school established under this chapter is... operated separately from the common school system." #3 Both Charter School Fix bills provide no protection for teacher salaries and therefore no protection for students to insure that they receive a quality education. The primary way charter schools generate massive profits for their promoters is to hire fake teachers with no actual training or experience and then lower the salary of these fake teachers by paying them peanuts instead of a living wage so that the average charter school teacher quits after one year. A 2015 New Jersey study found that charter school teachers make about $20,000 per year less than public school teachers. 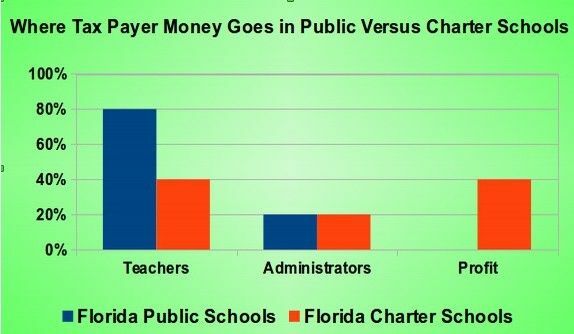 In April 2014, the League of Women Voters of Florida issued a report on fraud of charter schools. The report was shocking. They found that while public schools spent more than 80% of their funds on classroom instruction, charter schools spent barely 40% on classroom instruction. Charter schools spent much less on teachers and much more on overhead costs, management and rental fees. 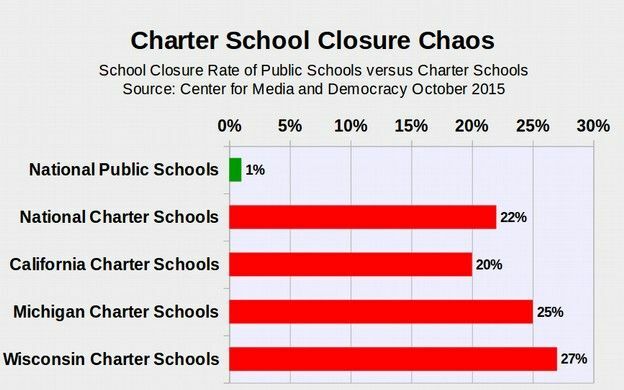 Charter schools had a closure rate of 20% per year. Numerous members of the State legislature benefited directly or indirectly from charter school kickbacks. Page 6: Charter schools are not subject to, and are exempt from, all other state statutes and rules applicable to school districts and school district boards of directors...Except as provided otherwise by this chapter or a charter contract, charter schools are exempt from all school district policies. Page 29: This section does not require a charter school to pay a particular salary to its staff while the staff is employed by the charter school. Page 36: Any bargaining unit or units established at the charter school must be limited to employees working in the charter school and must be separate from other bargaining units in school districts, educational service districts, or institutions of higher education. Any charter school established under chapter 28A.710 RCW is a separate employer from any school district, including the school district in which it is located. The clear goal of such language is to eliminate the right of students to an experienced teacher and the right of teachers to a living wage. In the past, both state and federal law regulated who could teach in our public schools. Teachers were required to have years of training in child development, learning theories, and classroom management. They were also required to complete a several month “practice” teaching experience under the guidance of an experienced teacher. After all of this, they were granted a “Provisional Teachers Certificate” which allowed them to teach. 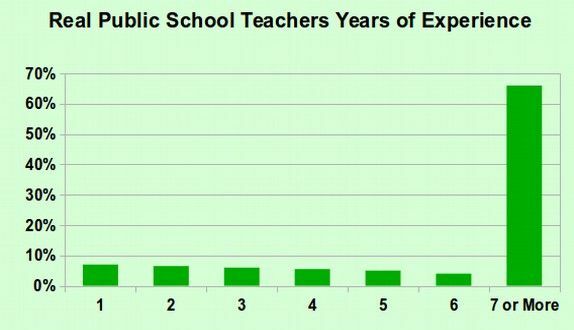 But in most states, additional training during several summers was required to get a permanent teachers certificate. The federal court also ruled that TFA recruits should not be concentrated in districts of high poverty and high disadvantage, where children actually need “highly qualified” teachers, not young college graduates with five weeks to training. For more on this subject, see Renee v. Duncan, decided on September 27, 2010, which struck down Arnie Duncan's crazy regulation that TFA recruits were highly qualified. All of this changed on December 21, 2010, when state and federal teaching standards laws were changed in order to allow TFA recruits to qualify as “highly qualified” teachers. It should be obvious that a recruit with only five weeks of training can not possibly be “highly qualified.” However, on December 21, 2010, Congress amended federal law to change the definition of “highly qualified to include TFA recruits. This was despite the fact that (or because of the fact that) the federal appeals court in California twice ruled that TFA teachers are not highly qualified. While a first year salary for a teacher at a traditional unionized school in Chicago is approximately $45,000, the starting salary at many of TFA’s partner charter schools is nearly 30 percent less at $32,000. A 2010 study found that “more than 50% of TFA teachers leave after two years and more than 80% leave after three years.” By comparison, over 60% of all real teachers - who typically have five years of training – leave after 5 years with most of the remainder staying for more than 10 years. 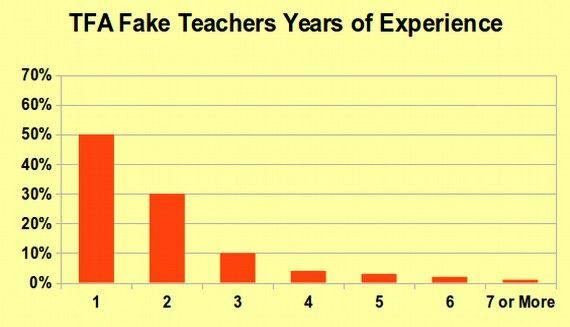 The following chart shows how long TFA recruits remain in the teaching profession. 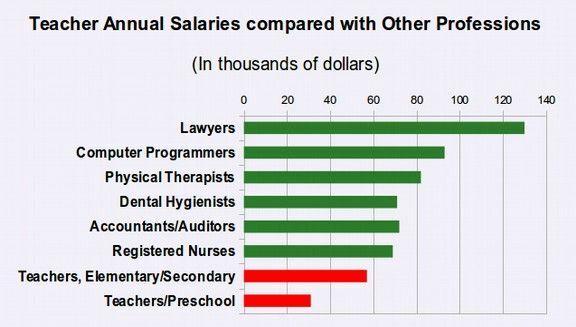 Another reason teachers suffer from a much higher turnover than other professions, besides the fact that they are being attacked by billionaires is that are among the lowest paid of all professions. Page 3: A charter school established under this chapter is a public((, common)) school that is... governed by a charter school board. 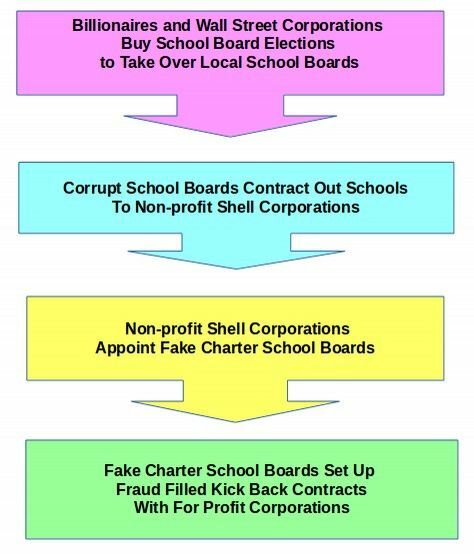 An unelected Charter School Commission sets up unelected charter school boards made up of rubber stampers selected by the very corporations the rubber stampers will oversee. Then the actual charter schools are allowed to set up contracts with any public or private entity while being exempted from all state laws. We have seen earlier that the phrase "non-profit organization is simply a scam shell of a for profit corporation. This structure is truly a framework for fraud! This is like the fox guarding the hen house. Only in this case, it is Wall Street corporations put in charge of guarding one billion dollars in tax payer funds as well as the educational future of thousands of Washington state students! The January 7th Fix tries to fool us into thinking that charter schools would be run by non-profits. Here is the language in the bill: Page 2: "(Charter School) "Applicant" means a nonprofit corporation that has submitted an application to the authorizer. The nonprofit corporation... may not be a sectarian or religious organization and must meet all of the requirements for a public benefit nonprofit corporation before receiving any funding. However, in December, 2014, areport was published called When Charter Schools are Nonprofit in Name Only which explains in detail many ways in which public tax payer dollars are funneled from fake non-profits to for profit corporations. This report described the common practice of charter schools pretending to be “non-profits” only to sweep all of the money out of the fake non-profit front group and into the pockets of private for profit “management” corporations. 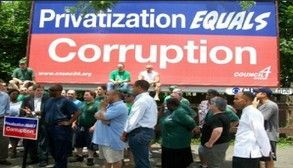 These “sweep” contracts divert nearly all of the charter school's public dollars to for profit corporations – with very little left to actually run the charter schools. Once the public money goes into the black hole of a private corporation, there is no way to keep track of how it is actually spent. #7 The Charter School Fix bill would reduce public meetings and public accountability for parents and tax payers. Elected school boards typically hold public meetings at least once a month during which time parents and other concerned citizens can let the school board know about problems in the schools that need to be addressed. If the elected school board does not listen to the parents and do something to fix the problems, there are elections every two years to vote in a new school board that will listen and take action. None of these protections exist with the appointed charter school board. In fact, the second charter school fix bill does not require any meetings and thus there is no opportunity for local impute on charter school board decisions. Since there are actually charter schools in 45 States, it is likely that the total fraud and abuse of tax payers funds by charter schools exceeds $300 million per year. The report contains news stories, criminal records, and other documents to detail abuses such as charter school operators embezzling funds, using tax dollars to illegally support other, non-educational businesses, taking public dollars for services they didn’t provide, inflating their enrollment numbers to boost revenues, and putting children in potential danger by foregoing safety regulations or withholding services. These are only a few specific examples of the thousands of cases of fraud involving charter schools nationwide. In another case, a charter school treasurer plead guilty to stealing $470,000 from 4 Ohio charter schools. The funds were supposed to be used for the education of students at four charter schools in Columbus, Youngstown and Dayton between 2005 and 2011, according to the office of the U.S. Attorney for the Southern District of Ohio. In 2013, 19 charter schools closed in the State of Ohio, joining 150 other charter schools in Ohio that had already been shut down since 2005. With about 400 total charter schools in Ohio, that is a failure rate of over 40 percent! "$1.4 billion has been spent since 2005 through school year 2012-2013 on charter schools that have never gotten any higher grade than an F or a D,"
Charter schools are closing in Ohio at a record rate after a series of fraud cases were uncovered. The tax payers are left to pick up the pieces and the kids suffer the loss of their schools and their education. Charter schools are funded by the state on the backs of school districts and taxpayers. Because charter schools are exempt from most state laws and do not have a publicly elected school board, there is almost no oversight of spending at charter schools. Over $900 million dollars per year is diverted away from public schools to charter schools in Ohio every year. But the bill doesn't stop there. When there is financial mismanagement, charter schools can be closed. But it is almost impossible to get the money invested in charter schools back. Nearly $187 million in tax money spent on failed charter schools is still uncollected. 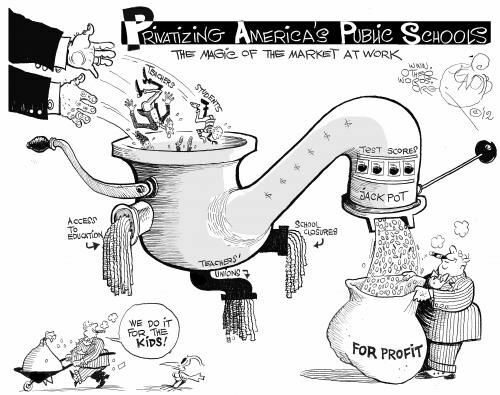 The only solution to corruption and fraud is to not allow private corporations to make profits off of public schools. The only way this will happen is to ban charter schools. As the recent Tulane University study confirmed, allowing charter schools not only creates a framework for fraud, but the chaos created by charter school closures harms students who see their both their public schools and charter schools closed. Specifically, students whose schools are closed have a 10% lower graduation rate than students whose schools are not closed. #10 The Charter School Fix bill diverts attention away from the Paramount Duty of the State legislature to provide full funding for our public schools. This is the most disturbing part of the Charter School Fix bill. The State legislature has already been found in "Contempt of Court" for failing to comply with their Paramount Duty under the Washington state Constitution to fully fund our real public schools. As we noted earlier, it would take $3 billion in additional state revenue just to bring school funding in Washington state up to the national average and lower class sizes in Washington state down to the national average. The real problem faced by our schools is that our class sizes are way too large. Yet despite these massive and urgent problems affecting the lives of one million students, there has only been ONE BILL submitted in the Washington state legislature that would generate the billions of dollars needed to actually reduce class sizes down to the national average and provide our students with the safe schools they deserve. That bill was Senate Bill 6093 sponsored by Senators Chase and McAuliffe - which would provide more than $3 billion per year in annual revenue by repealing a 1997 tax break used by the very wealthy to avoid paying their fair share of state taxes. Are tax breaks for the wealthy really more important than the lives of half a million students? It is time to start requiring billionaires to pay their fair share of state taxes so we can finally address the school construction backlog here in Washington state. As always, we look forward to your questions and comments.